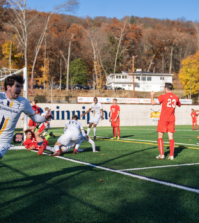 The Quinnipiac men’s soccer team seemed to be hitting its stride. 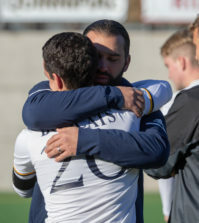 After an underwhelming start to the season where goals were a painful rarity, the Bobcats had rattled off five wins in six games, including a 1-0 victory over Manhattan in the MAAC Quarterfinals. They finally looked ready to live up to their preseason hype, needing just one more win to return to the conference finals and finish the job. Unfortunately for the Bobcats, they ran into an immovable object in the Fairfield Stags, who stormed up the MAAC standings down the stretch of the regular season thanks to a streak of eight straight matches without a loss. Fairfield hadn’t lost a match in regulation since Sept. 1, and earned itself the top seed in the MAAC Tournament. For the first 90 minutes, and then 110 minutes, it looked like somebody didn’t have to lose. Neither team budged an inch through regulation or the overtime periods, but Fairfield eventually broke through on penalty kicks to send the Bobcats home, ending their season just before they seemed to be reaching their peak. The semifinal match on Thursday, Nov. 9, was a reflection of the preseason polls, only in reverse. 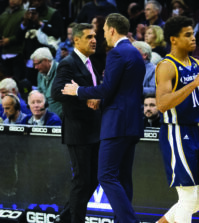 The fifth-seeded Bobcats were the preseason favorite, while the Stags were picked fifth before the season began, only to ride their way to the number one seed after a scorching hot finish to the regular season. The Bobcats simply met the wrong team at the wrong time, despite trending upward themselves after a rough start to the season. “Although we had a tough non-conference season, we had the spirit to come together as a team and be loyal and true to one another,” senior captain Max Rothenbeucher said. The momentum of the Stags wasn’t the only adversity the Bobcats had to face. Former MAAC Rookie of the Year Eamon Whelan battled a groin injury for the entire season and, while he scored two goals in the final five regular season games and appeared to be on his way back to health, the sophomore didn’t factor into either conference tournament games. The disappointing finish wasn’t without its moments. The Bobcats reached the semifinals thanks to a circus goal from senior Will Pustari, who fielded a long entry pass off his chest with his back towards the net before turning and meeting the ball on a high bounce to send it past Manhattan goalkeeper Marcellin Gohier. Pustari made contact after the ball bounced up near the gold number two on his jersey, converting on a high-swinging, tomahawk kick that would have made Mr. Miaggi proud. 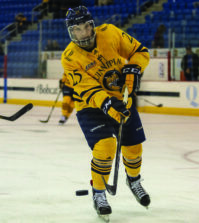 The Bobcats had no such luck in the semifinals against Fairfield netminder Gordon Botterill, who pitched a shutout after recently being named to the All-MAAC Second Team. The Bobcats outshot the Stags, but Botterill wouldn’t give. He continued his momentum into Sunday night, blanking Rider 1-0 to give the Stags the MAAC crown. There is likely little consolation to the Bobcats in their semifinals appearance. There is no added comfort in knowing they came just a penalty kick or two from beating the regular season champs, who eventually won the whole thing. Still, there are plenty of positives to take away from the season, regardless if more may have been expected. Doig finished his farewell season with 38 career victories in a Bobcat uniform, the most in school history. Doig’s last two seasons have ended in painful losses, but was named to the All-MAAC Second Team for the second straight season after coming back from a brutal leg injury suffered in 2015. He will end his Bobcats career as the most successful player in Bobcats history when it comes to the stat that matters most to him: wins. Da Costa will be looking for new leaders to step up next season as he says goodbye to Doig, Rothenbeucher, Pustari, midfielder Shaquille Huggins and midfielder Filosmar Cordeiro. Most of the Bobcats’ offensive production will return next fall, as the returning squad will look to finish the job that the Bobcats have come so close to accomplishing in each of the past two seasons.